In this Dec. 3, 2018, file photo, fighters from the Syrian Democratic Forces (SDF) attend the funeral a fellow fighter killed in the town of Hajin during battles against the Islamic State (ISIS) group, in the Kurdish-controlled city of Qamishly in northeastern Syria. U.S.-backed, Kurdish-led fighters captured the last town held by the Islamic State group on Friday, after days of intense battles in the militants' single remaining enclave in eastern Syria, activists said. 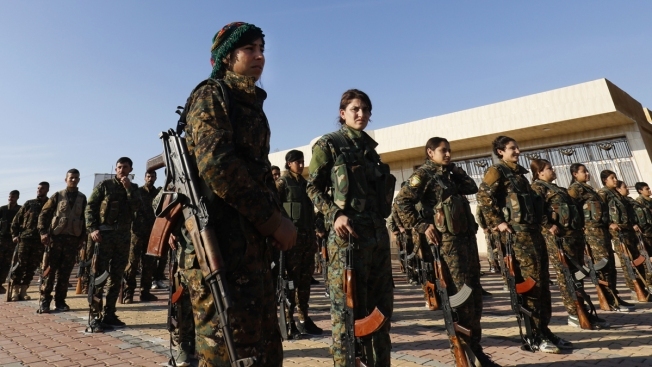 The Britain-based Syrian Observatory for Human Rights said the SDF took Hajin early in the morning, after fierce fighting under the cover of airstrikes by the U.S.-led coalition. It said some ISIS fighters withdrew to the villages and that fighting is still going in the fields outside Hajin as SDF fighters chase the extremists. Europe-based activist Omar Abu Layla of the DeirEzzor 24 monitoring group confirmed that the town was taken, adding that some ISIS fighters are still holed up in small pockets on the edge of Hajin. The area was home to some 15,000 people, including 2,000 IS gunmen who have been fighting back with counteroffensives and suicide attacks. Over the past days, hundreds of civilians were able to flee the enclave toward areas controlled by the SDF east of the Euphrates River and government-controlled regions on the river's west bank.